I first learned about Warren Elsmore through a LEGO book I found called Brick City. I wasn’t sure if he would agree to be interviewed but I gave it a shot and sure enough he was kind enough to spend a bit of time answering questions. Warren is a builder of big things. At least that is how I think of him. His builds are so detailed and so very large. They are really amazing and he is a fabulous builder. 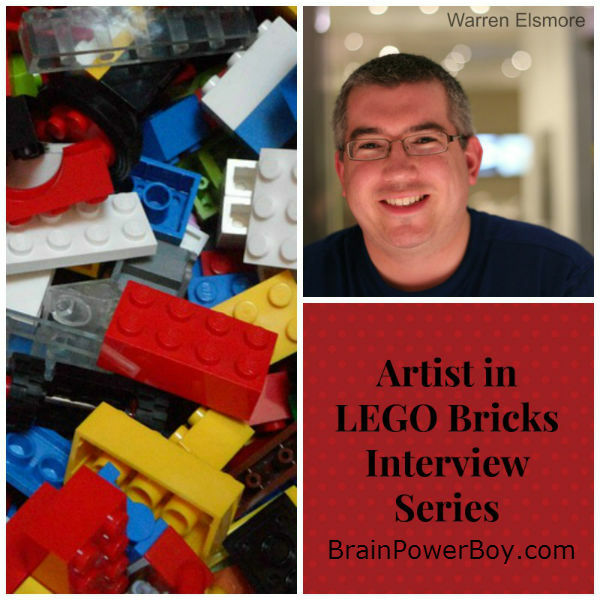 We love LEGO on this site so getting to interview Warren was a treat. A bit of history. The LEGO company started in 1932 and people have been building creations ever since. LEGO is a big part of many boys’ childhoods and I thought it would be great to speak with some of the artists who are building wonderful things in LEGO, ask about their childhood toys, what they have learned from LEGO and if they have any advice for your boys. Our first interview is with Warren Elsmore who has been working in LEGO since he was a child but has made LEGO his career for the last 5 years. Warren lives in Edinburgh in the UK and travels the globe sharing his creations. He is an artist in LEGO who creates models for individuals and companies. Don’t you think that it is inspiring that he got to make his passion for LEGO into a money making career? Warren wrote the Brick City and other LEGO books you have to see. It is his first book and I personally hope he writes many more. You and your boy should take a look at it. It is really wonderful. You can check out our Brick City Book Review for more information. I contacted Warren with the following questions and he agreed to share his insights with you and your boys. Warren: “Apart from LEGO, I had very few other toys! LEGO sets were always my birthday and Christmas presents every year! The only other toys that I was ever interested in were Transformers and Zoids. Warren: It’s important to remember that adults still play with toys. We just call them ‘hobbies’! There’s no real reason to stop playing with LEGO as an adult and many people do – it’s becoming a very popular hobby in itself. However there other ways to use LEGO in adult life too. Because of its ease of construction, there are lots of stories of it being used to create signs, stands, quick fixes for things or even PC cases! Of course LEGO doesn’t change either – so the LEGO that you have now will still work with your sons’ or even grandsons’ LEGO. So if you really need an excuse to start building, then it’s a great way to connect with other members of the family. Warren: “I’ve learnt alot – both about construction itself and the ‘soft’ skills too. Once you start building big LEGO buildings it of course teaches you about planning, design, colour etc. As soon as you start displaying your creations to other people though, you also learn some project management skills. Making sure that your building is complete in time for a show, and in budget to what you have available. Learning how to explain it to other people sometimes too! Warren: “I guess my main advise would be to carry on building! That’s how I started and how LEGO building became my career. When I got to 15 or 16, I did actually stop building – there were many other things to do and LEGO wasn’t cool anymore. That was also because I didn’t know anyone else my age that did still enjoy playing with LEGO. 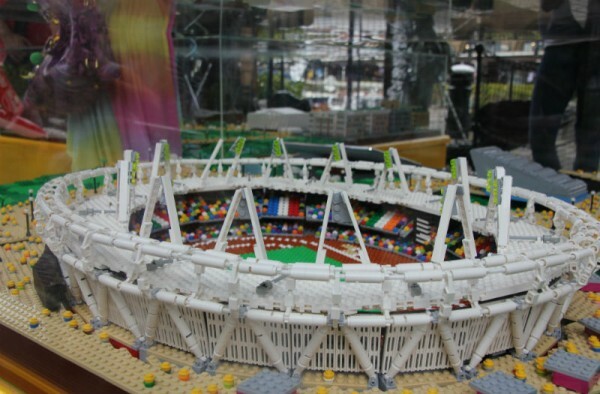 Now, of course, it’s very different and there are a lot of online clubs and societies for adult LEGO fans. So my main advise would be to keep building and as you get older, start looking online at the online LEGO communities. Once you’re able to start uploading pictures of your models to Flickr, Facebook etc.- do that and ask people to comment on them. Of course, not everyone may like what you’re done but it’s important in all aspects of life to ask people to review your work and see what praise or criticism comes back. A big thank you to for Warren for taking time out of his busy schedule to share his interest in LEGO with all of us. Click below to share this article with others who are interested in LEGO and would like see an interview with an artist working in LEGO. Feel free to leave me a comment to let me know which LEGO creators you are interested in hearing from.